We are excited to be partnering with Boost as we jump on board this cashless and cardless bandwagon to be a chain of convenience stores that provides a convenient and secure way of payment for all our customers. Consumers can now conveniently pay for one's goods the cashless and cardless way at all KK Super Mart Convenience Chain Stores following its partnership with Malaysia's homegrown e-wallet app, Boost. This partnership brings together two homegrown brands joining forces to further strengthen the offline retail network and encourage the transition into becoming a cashless and cardless society. Owned and operated by KK Supermart & Superstore Sdn Bhd, the flagship business of the group currently comprises 327 outlets mainly in Klang Valley, Malacca, Seremban, Sarawak and regionally in India and Nepal. KK Super Mart is one of Malaysia's fasting growing 24/7 convenience chain located strategically in densely populated areas offering competitive prices with 9,000 variety of daily essential products including the KK house brand. "We are excited to be partnering with Boost as we jump on board this cashless and cardless bandwagon to be a chain of convenience stores that provides a convenient and secure way of payment for all our customers. This marks the very first time we are collaborating with a technology company. It's always been a priority for us to keep up with the current trends in offline retail and move with our customers. With the shift in digitalising the nation, this partnership is a strategic step as we continue to grow our business and customer base. We look forward to the working partnership with Boost as we head towards becoming a cashless and cardless society," said Datuk Seri Dr. KK Chai, Founder & Group Executive Chairman of KK Group of Companies. Boost is a leading e-wallet application with over 2.5million users with online and offline merchants located in over 25,000 touchpoints. Boost aims to revolutionize the way Malaysian consumers transact by creating a seamless payment experience without cash or cards. As a lifestyle application, users can perform services such as paying utility bills, buying prepaid top ups and digital vouchers as well as gifting them, free money transfers and even "Go Dutch" with its unique split bills feature. Today, Boost users can pay for one's items and also get instant cash back when transacting at KK Super Mart. 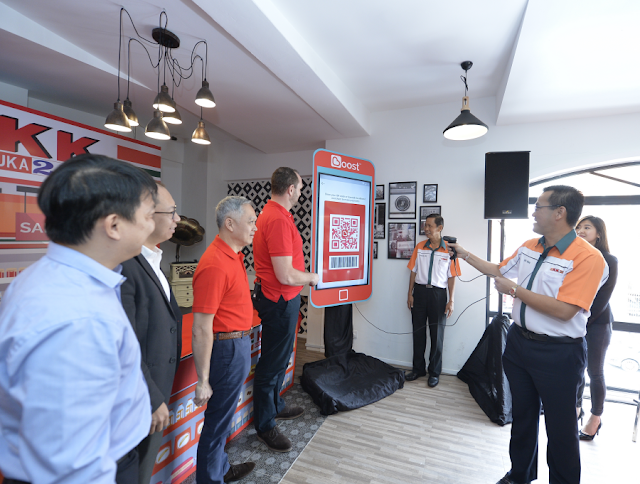 In conjunction of this partnership, Boost will be offering RM10 cashback to customers paying using Boost at any KK Super Mart Convenience Chain Stores in Malaysia, with a minimum spend of RM20. This offer will run from 26 June until 25 August 2018. "We are proud to be partnering with KK Super Mart Convenience Chain Stores as we continue to expand our merchant touchpoints nationwide. By creating relevance and providing seamless user experience for all KK Super Mart Convenience Chain Stores customers, we aim to continue doing so by boosting more 24/7 convenience stores nationwide. As Boost becomes synonymous with being the faster, easier and more secure payment option, it is our constant endeavour to make Boost ubiquitous by widening and strengthening our network of merchants. We are excited at the prospects of Boosting and providing a more rewarding experience for both our partners and users," said Christopher Tiffin, Chief Executive Officer of Boost.